« What is The Ketogenic Diet? Strawberry, Chocolate and Butterscotch Fat Bombs! 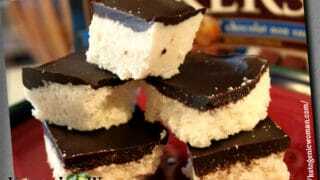 Cream Cheese Fat Bombs Recipe – Pudding and Jello Pops! I think I just died and went to heaven. I just popped my first Jello Cream Cheese Ball and it was divine. happened to have some cream cheese in the fridge and sugar free jello in the cupboard. Strawberry as a matter of fact. Here in Canada we have only 3 flavors in the stores but I can order my Sugar Free Jello from Amazon and get more variety. And then from there of course, I had to try dipping them in sugar free pudding mix, as you can see from my main image above. But I do have to say, that after all the flavors that I have experimented with, I still like the tart flavor explosion of using the Jello Strawberry, Raspberry or Cherry. These cream cheese fat bombs are definitely The Bomb! 1 8oz package of Kraft Philadelphia Cream Cheese or any brand as long as it’s the solid brick type. Note: If you want to do a smaller amount, 1 tbsp of mix does about 4 cream cheese balls. Take the package of Cream cheese and cut into 16 squares. Put the jello or pudding mix in a sandwich baggie. Take each square and shake until covered with jello or pudding mix on all sides. Keep covered with plastic wrap in the fridge. Serving size is 2 balls. 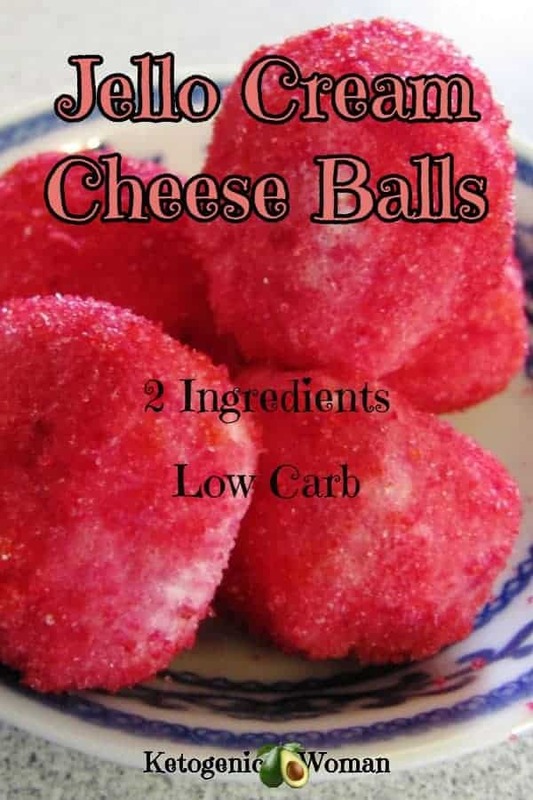 Each serving of 2 cream cheese balls is 105 calories, 1 carb, 9 g fat and 3 g protein. 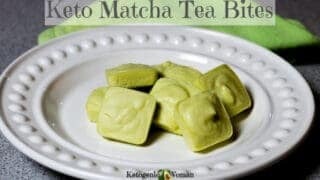 These make a perfect snack for Keto, Atkins, LCHF or any other low carb diet. You could also make a plate of these as appies for a party. 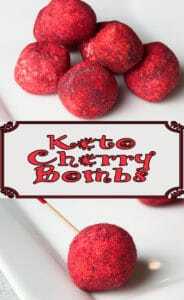 Put colorful toothpicks in them and you will have a plate of cherry bombs, lemon bombs, pudding bombs, etc They will be a hit! 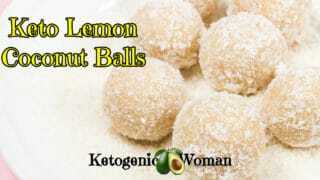 How about more easy Keto Fat bomb recipes? 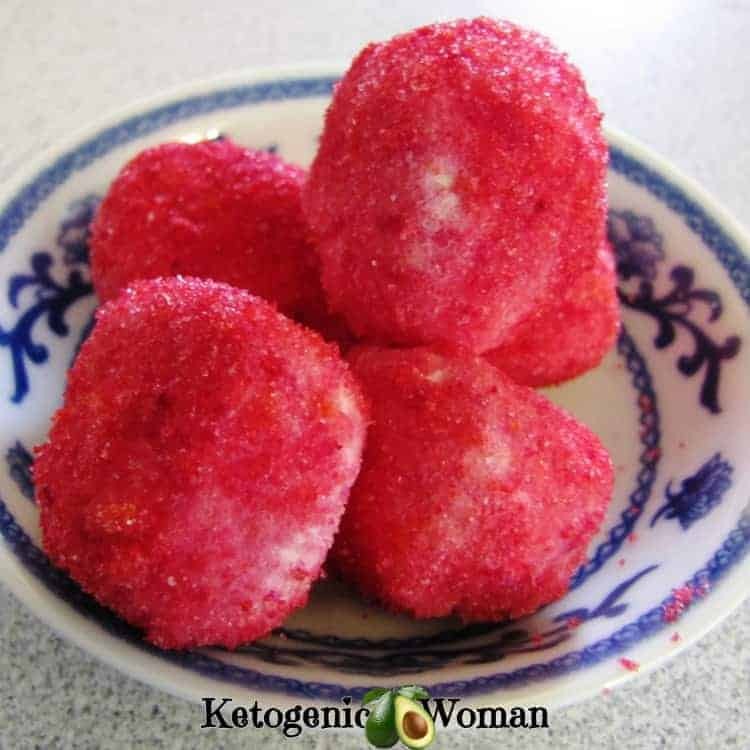 If you like these Keto Jello Cream Cheese balls, then you will also love these other low carb fat bombs! 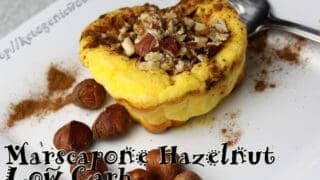 Need more Keto dessert ideas? 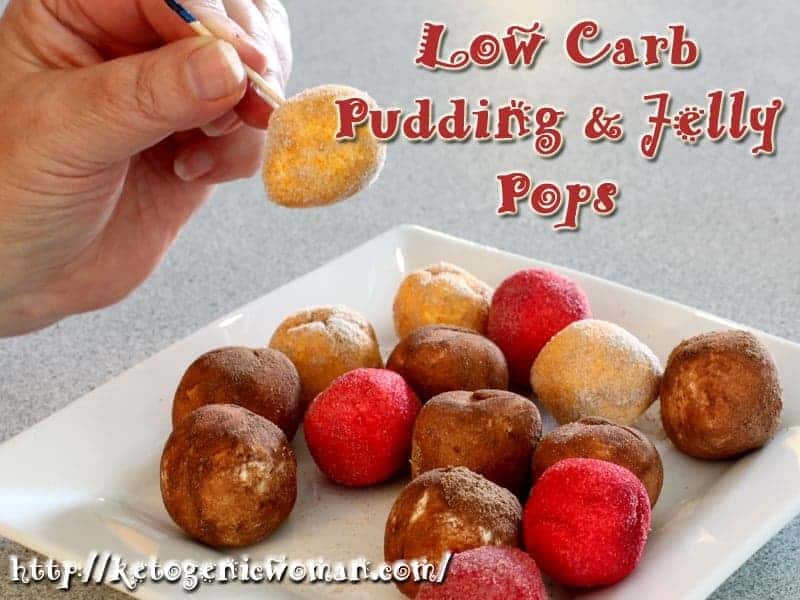 Tagged cream cheese, fat bombs, low carb pudding pops. Bookmark the permalink. Today is my first day on a Keto lifestyle! Everyone in the house were enjoying root beer floats! I through these together and they were delicious! Better than a float! ? That’s awesome! I’m glad they saved the day! Any suggestions for rolling cream cheese into balls with the red jello mix? yes, I use gloves! I always have a box of those gloves they use in restaurants for food prep, they are fantastic! They look like these. I will add that to the tips in the post, it’s one of those things where you assume people know about them. I know what you mean about the red jello! Use your cheese slicer to cut cream cheese ! These sound wonderful! I haven’t tried them.. but will soon! Wondering if anyone used chocolate cream cheese? There’s chocolate cream cheese? Sigh, I live in Canada and have never seen this! Somebody out there give it a try, I’m thinking chocolate cream cheese with sugar free orange jello might be a good combo! I live in Canada, Toronto area, found Philadelphia chocolate cream cheese. Zehra’s/Loblaws chain. oh hmmm, I think they own the Superstore, I will check it out. Thanks for the info for us Canadians! I can find Jello brand fat-free pudding but haven’t seen sugar free. Where would I find it before checking amazon? I kind of thought Walmart had it, at least online? Just cocoa to your cream cheese! I’ve never seen or heard of chocolate cream cheese itself. Wouldn’t you just add cocoa to it to make it chocolate or how about sugar free chocolate syrup? How many Weight Watcher points is. Each one of these balls ? If cheese balls are 1tbs each. How do you slice your cream cheese? Just a knife or is there a trick to it? No trick! When the brick of cream cheese comes out of the fridge you can use a knife to slice it up. These comments really inspired me flavor wise! I’m going to try the jello ones and I love coffee so I’m thinking about rolling them in some sugar free French Vanilla Instant coffee could do that alone or in combo with cocoa little balls of energy hehe! oh gee, I really like the sound of that! Thanks for sharing! I just made these using cheesecake flavoring (higher in carb I know but desperate) was kinda meh until i added a little unsweetened cocoa and cinnamon..delish!!! I cant wait to get some SF jello, cant get easier than this!! I love these. I made some rolled in sf orange jello and cocoa powder. Black Cherry is good too but I agree with you that raspberry is the best! Whoa! Chocolate and Orange, never thought of that, that would be killer! Thanks for sharing! I wanted to make these so bad, but didn’t have jello or pudding. I didn’t give up. I have those flavor packets you put in water that I get at Walmart. They are true lemon brand. One is raspberry lemonade and the other is peach lemonade. I like them because they have stevia in them instead of artificial sweeteners. I made half and half and let me tell you they are yummy! Thank you for sharing! My sweet tooth thanks you too! Wonderful, that’s an excellent tweak! Yum, I just made these and they are so so good.. thank you for the recipe .. Going to try slicing the cream cheese with dental floss. Would using a low fat cream cheese lower the calorie and fat gram? And how do you calculate it? Yes it would for sure. What I do is I key my whole recipe into My Fitness Pal and then divide the totals by the number of servings to get the macros and calories per serving. My Fitness Pal is free. Would using a low fat cream cheese lower the fat grams and calorie intake? And how do calculate that? Just look on the label on the box. It will give all of the details. How long do they have fridge before you can eat them ? Oh I eat a couple before they ever get to the fridge! You just need to store them in the fridge to keep them fresh, you can certainly eat them right as soon as you like. took some raspberry jello and pushed it into the centre of the cream cheese then rolled in coco powder!! Not bad! ooooo Raspberry and chocolate together is always a good thing! Yum! So EASY and DELICIOUS!! I did the strawberry and can’t wait to try other flavors. Thank you!! Glad you like them! I think Raspberry is my favorite. One word – AWESOME. so easy and delicious. Thx for such a great recipe. I love reading all the comments and recipe ideas. I think I may try rolling mine in my good flavored protien powder. Cookies and cream, mint chocolate chip, or strawberry. oh hey! Now I’m liking that idea! Wonderful! 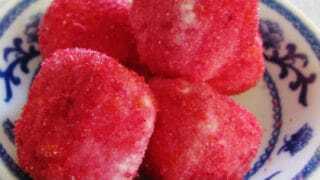 Yummm….put Raspberry Sugar Free Jello into a 1 at zip lock bag…added the cut up cream cheese squares, closed the bag and shook it up…took them out and rolled them round then transferred them to a smaller bag and into the fridge…. I think Raspberry is definitely my favorite! Your welcome, hope you love it! Hello! I am fairly new to the keto woe. Still looking for new recipes to try so I do not get board with my menu. I see all kind of fat bomb recipes. What do they do for you to help lose weight and how many are allowed as a serving daily? Thank you. 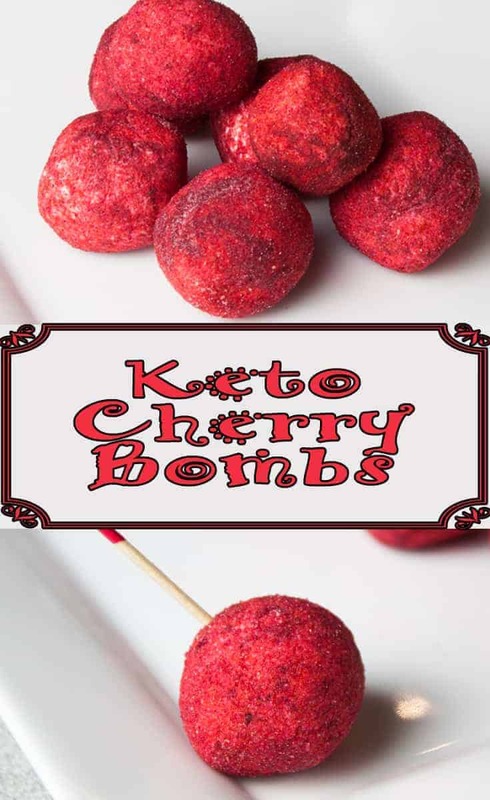 Because the Keto WOE is higher fat than other eating plans it can be a challenge to keep up the fat ratio so this is why people use fat bombs. That said, I feel that many people get stuck on their weight loss goals because they eat too many fat bombs and too much dairy. So the answer to your question is to eat just enough to satisfy the macros you are trying to maintain. No, I don’t think freezing cream cheese would be a good idea, but who knows, I’ve never actually tried it! They are usually gone within a few days so no need to freeze. I froze them – delicious! Are you eating them right from the freezer. only out for a short time, or set out for people to nibble on (for 15 min or so)? freezing is just fine – look at how many frozen cheesecakes are in the stores! Well that just makes so much sense! Thank you! DON’T FREEZE THEM! It ruined mine. When they thaw out they fall apart and are kind of crumbly. They still taste great but hard to eat. ok, I better do a small experiment this weekend! What about dipped in a mixture of cinnamon and your choice of sweetener. lol, yes I can imagine it! I do find the jello mix easier to work with, it’s nowhere near as sticky. And I love the sweet and tart taste of the jello balls. The pudding balls taste completely different, more of a cheesecake feel. I just made this. DELISH!! I just put the heavy whipping cream in the chilled bowl of my stand mixer, I then speinkled the pudding mix over the entire top surface of HC. This prevented the pudding from solidifying into a lump. If you like sweeter desserts you may want to add some sweetner to taste. Xylitol is a great sweetener and you don’t get the ‘Aspartame-like’ after taste in Stevia and other artificial sweeteners. I actually really like xylitol as well as the fact that it’s made from birch trees. My only warning would be to try it cautiously the first time. If I have a xylitol packet with coconut oil in a coffee, I am glued to the bathroom for hours. Apparently, only a small % of people are affected this way. But there are times that this laxative effect is a good thing! Can you just mix the jello mixture into the cream cheese and not necessarily coat them? I’ve never actually tried that but sure, I think it would work. They would look different but still taste amazing. Are your measurements right? It took me 1tbsp to make 18. Do I mix the jello in the cheese or just coat it? You are just going to coat the balls. SO you used 1 tbsp jello mix for all 18 balls? I’ll have to do it again this weekend, maybe it’s a taespoon then. I don’t usually do it that way, I usually use the entire package for 1 brick of cream cheese. I figured something this simple couldn’t possibly be great tasting, but boy was I wrong! I tried strawberry first and it was amazing. I’ll try other gelatin and pudding flavors, and if they are half as good I’ll be one happy keto’er. Thanks! Glad you like them! I actually like the Jello ones better than the pudding ones, but that’s just me. Can you mix some Stevia or carb free sweetener in the cream cheese before making these? Also, how would the consistency be if I left them in the freezer? I have never frozen cream cheese before so I can’t answer that question. You could probably sprinkle some sweetener onto the cream cheese balls but try first without, they might already be sweet enough. When I make them I put them in the freezer for an hour and put 3 in a bag an then keep them in the fridge the taste better to me. I have to second the recommendation to try without sweetener first. Just using plain cream cheese with sugar free strawberry gelatin ended up being sweeter than I expected, and made my “sweet tooth” very happy. yes! And I love the creaminess combined with the sweet and tart jello flavor. I read recently Stevia does not work well in chocolate treats. The “off-taste” is accentuated. With whipped cream or fruit Jello products, Stevia appears to taste better. Texture like Frozen Mousse, I’d figure. i get violent headaches from sugar free anything, I am doing unsweetened coconut and/or coco, keeping it all keto too. Yes, I get headaches when I drink certain sugar free drinks, especially if they are red in color. Yes, I know what you mean about them being sticky. I only make a small amount. The Jello ones don’t get like that so I try to make a plate of those. The kids like them too. I LOVE the lime ones, they make my mouth pucker but in a good way! I thought using sugar substitutes like Equal wasn’t recommended? That is a personal choice that everyone can make for themselves. You certainly don’t want to overdo them. When that sweet tooth hits I think it’s better than eating the junk food out there. I’m new to keto and froze a cream cheese bomb made with pumpkin, PPS and stevia. It was a big batch so it lasted about 3 weeks. It got just a titch dry but was still very good. Maybe I should have covered with wrap to stay fresher. I think the pumpkin help it stay ok.
I’m going to try freezing some because I made a big batch today! oh yes, I keep mine in the back of the fridge for a few days. I try not to have more than 2 in a day. OMG!! Just made some using sugar free pistachio pudding mix and tasted like ice cream! thank you so much for such a good idea! oh wow, pistachio sounds amazing! I’m going to try that too! That should work great! Sort of like shake and bake! I’m going to try that next time. You could also mix cocoa powder with Swerve and maybe a little vanilla, instant coffee, and cinnamon! OMG my mouth is watering! Thanks for the recipe! Funny, actually I like that idea! As you can see from the photo my jello balls are far from perfect! I love the cookie scoop idea, thanks for the tip! Jeanette, do you know that manufacturers of low-fat and fat-free products add starch to their mixtures, to replace fat? They do. Check the carb count in comparable products. If you’re on low-carb or keto for the weight loss, they both specify full-fat dairy. Yes Great with sf pudding! !I used banana cream…next gonna try chocolate fudge!!! I love this idea. Been trying to come up with some recipes that will go with my little sister’s baby shower theme. We’re doing a Little Monsters theme and I’ve seen the small cheese balls they made that look like little monsters but they’re only the color of the cheese. I love the idea of this because not only can you vary the colors … it varies the flavors too. Thank you so much for sharing!!! oh wow, that is a really good party idea! You’re right, they will add some great color! I made these jello cream cheese balls and the key is to sprinkle only a tiny bit of jello into a bowl and coat one ball very lightly. Then sprinkle more and do a second one. The dry jello mix is VERY strong and it really is too sweet and strong if you coat it a lot. Also I found that smaller balls are better because you get a good balance of sweet jello and cream cheese. Awesome emergency treat for sure. Thanks for sharing:) I used cherry-YUM! But I’m also going to use orange for a “creamsicle” treat! 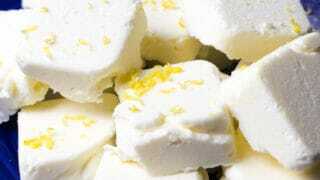 What about softening the cream cheeseand mixing the sugar free jello in? I may try this with the sugar free pudding too. Did you ever try the jello balls using pudding? And if you did, how did they turn out? I have not because we don’t have the sf pudding mixes here. I’m tempted to order from Amazon and see how that turns out. I made the peach ones tonight. Walkmart had the peach flavor. So delicious!!! Peach!? I have not seen that flavour in my Walmart. I bet it was good! I wonder if these could also be good as a frozen treat? Hmmm, I’m not sure if cream cheese freezes well. Maybe someone who has tried that can chime in and let us know! I’ve tried freezing cream cheese and it doesn’t freeze well. As it thaws it separates. Don’t even try to freeze cream cheese. It makes it grainy and not at all palatable. I would try the chocolate but the dye in foods is very bad for you! No, actually the infinitesimal amount of dye in foods is not going to hurt you. I suppose some people might have a sensitivity to some dyes, but that is not common. The pudding sounds great, but it does have a few more carbs. If you really want low carb with the gelatins, go with the Walmart brand. It doesn’t even have maltodextrin in it (at least not in the black cherry flavor, haven’t checked others) that the brand name Jello does. Wow I cant wait to try this! I’m going to try chocolate covered cream cheese balls too. 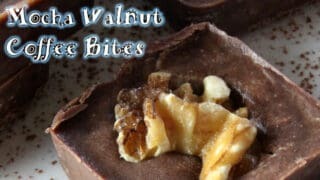 Using homemade chocolate! That sounds really great! I’ll be posting a recipe for Emergency Chocolate soon! The cream cheese balls are just so handy to have around for emergencies as well. Hello – I just started a keto diet a few days ago and found your site while looking for recipes. These jello balls look like fun treat. Are they messy? actually, I thought it would be really messy to make but was not too bad. I used the Philly cream cheese in a brick and made sure it was good a cold out of the fridge. By the end, there was for sure jello powder all over my hands but the cream cheese stayed intact. I just tried cherry today and that tastes a little strong, I want to try lemon next because I think that will taste like cheesecake!